We all spend a lot of time in our kitchens so it’s important that you make sure you stay on top of cleaning up after yourself. We all know that disheartening feeling of returning home after a long day at work, to be met with a mountain of washing up. To avoid these situations, you need to get into the habit of cleaning up after yourself as you go to avoid any build-ups. Sometimes it can feel like you’re forever cleaning up after yourself and others in your household. via GIPHYKitchens are actually one of the germiest rooms in the house and yet they are often overlooked in the cleaning routine. You might give the kitchen a once over with the hoover and wipe down the sides but how often do you REALLY CLEAN your kitchen?! We have put together a few good kitchen habits you can adopt to make your life a little easier, as well as some kitchen habits to break! Whilst there are some routines that make maintaining your kitchen’s cleanliness an easier task, there are other habits that should be avoided. Leaving washing up in the sink – When we can’t really be bothered to do the washing up, the easy alternative is to discretely hide things in the sink so the sideboard still looks tidy. However, the washing up hardly ever gets done ‘later’, instead a pile builds up until it reaches the point where it is cascading over the sink and you are forced to tackle it all in one go. It’s also then a real nuisance when you come to washing up as you have to remove all of the dirty dishes from the sink in order to have enough space to wash up. Asides from being annoying, it can also be quite dangerous if you leave any sharp items like knives in the sink whilst there’s still water in there – chances are that when the next hand delves into the bubbly water to retrieve a dirty dish, they may well cut themselves on an unseen knife blade instead. Leaving water in the sink – Not only does leaving water in the sink conceal any sharp objects lurking beneath, it can also attract some small insects, particularly in hot weather. It also leaves a grimy mark around the sink when you drain it, where the scum from the top of the water has settled. Putting knives in the dishwasher sharp side up – It can be dangerous to put knives the wrong way up in the dishwasher, especially if you have young children in the house. When loading the dishwasher, make sure you put knives in pointing downwards, towards to the floor. This will avoid any nasty accidents in case someone trips or falls, and will also protect people’s hands when they grab a bunch of clean cutlery from the dishwasher. It is also advisable that you wash knives by hand rather than putting them through the dishwasher, as this may cause them to blunt over time and damage other items. Not using the chopping board – Lots of people avoid using chopping boards in an effort to reduce the amount of washing up. However, the repeated impact of a knife on a worksurface or plate will damage the surface over time, and worksurfaces are much more expensive to replace than a chopping board! The grooves created by a chopping knife also make worksurfaces uneven so there are more nooks and crannies for germs to gather in and escape the sanitiser spray. If you really can’t be bothered with washing up a heavy chopping board after every meal, it might be worth investing in a mini plastic shopping board. These can be bought in most kitchenware shops and make washing up much easier. Pouring anything and everything down the sink – grease, fat, coffee grounds, you name it! – It can be tempting to treat your kitchen sink like a dustbin, pouring anything and everything down the plug hole, so you don’t have deal with it. However, sinks aren’t designed to drain solids and therefore can’t cope with an ongoing stream of leftovers. Over time, all of the crumbs and grease that have been washed down the sink build-up inside the drain, usually at the U-bend. Eventually, this will build so much that it blocks your sink and stops draining altogether. To avoid this problem, always thoroughly scrape your plates, pots, pan etc. into the bin/food waste bin before washing up. Two of the most common culprits of clogged kitchen sinks are coffee grounds and fat/grease. Even though fat may look like a liquid, it will solidify and block the drain. Rather than pouring fat directly into the bin, you can pour it into a container, leave it overnight and then scrape it out in the morning once it has solidified. 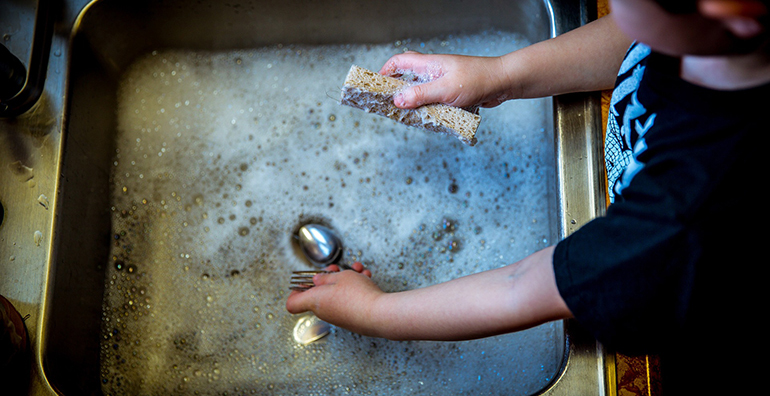 Replacing washing up utilities on a regular basis – It should come as no surprise that the brushes, sponges and dishcloths you use for washing up, harbour a lot of bacteria. They are constantly coming into contact with different germs and raw food, and are then left damp, to air dry. Over time they will gather bacteria and transfer it to your ‘clean’ dishes. It’s good practice to rinse all crockery before washing and also to soak your brushes in diluted bleach a couple of times a month. It’s a good idea to store new brushes and sponges under the sink, so you can replace them every month. Organising the waste system – It makes life a lot easier if you spend some time setting up an efficient waste system in your kitchen so you can keep on top of your rubbish. It’s a good idea to have all bins in one place, maybe in a drawer or cupboard. Use different containers to divide what goes into each bin: general waste, recycling and a separate bin for food waste. Using a system like this will keep your kitchen tidier, reduce the amount of general waste you dispose of as you will be recycling effectively, and also reduce any unpleasant odours that come from the bin. Washing up as you go – There is nothing more frustrating than going to the kitchen cupboard for a glass, only to find the dodgy cup with a crack in it that you have hidden right at the back. You then have to go on a glass hunt around the house and somehow manage to retrieve around 12 cups that have been dotted throughout your home! Instead of going for a new glass each time you need a drink, just wash out the one you have been using and reuse it. It’s a good idea to hide away any excess glasses for when you have guests and limit the number of glasses in the cupboard to the number of people living in your household. This way, you won’t be tempted to use another. Disinfecting the drying rack – A drying rack is a great alternative to using a tea towel as it not only saves you time but also avoids contaminating the clean dishes with germs transferred from a tea towel. 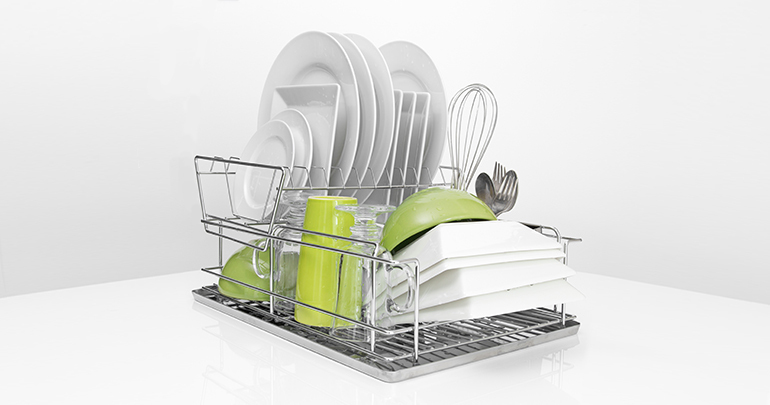 However, drying racks are often overlooked in the cleaning routine, leaving them harbouring germs and bacteria. It’s important to ensure that water is draining properly, otherwise it will collect and grow mould and bacteria. You need to clean and disinfect the drying rack and surface underneath a couple of times a month to keep it sanitised. Transfer your leftovers to different containers – It’s easy to get lazy and just pop the whole pasta bake in the fridge after it’s cooked. Although this might seem like a good idea at the time, it is a habit you need to break. Pots, pans and trays take a long time to cool down, so even when they have been moved to the fridge the container will still be keeping the food warm for a few hours, giving it time to grow bacteria. Instead, you should transfer the contents to another container and then store it in the fridge. It also won’t take up as much space as trying to fit the whole pan in! Now you have a list of kitchen habits to break and make, you should notice that your kitchen cleaning routine becomes a bit easier and your home will feel cleaner. You should be able to keep on top of kitchen maintenance and the washing up, without it pilling high. If you need a helping hand with cleaning, Workbusters can meet your needs. Whether you’re looking for regular help or the occasional deep clean, we can help. 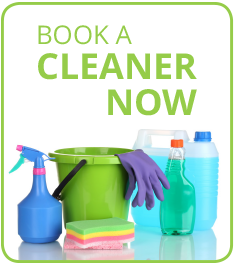 You can contact our friendly team to find out more about the cleaning services we offer and how we can help you. © Workbusters Services Ltd 2015. All rights reserved.